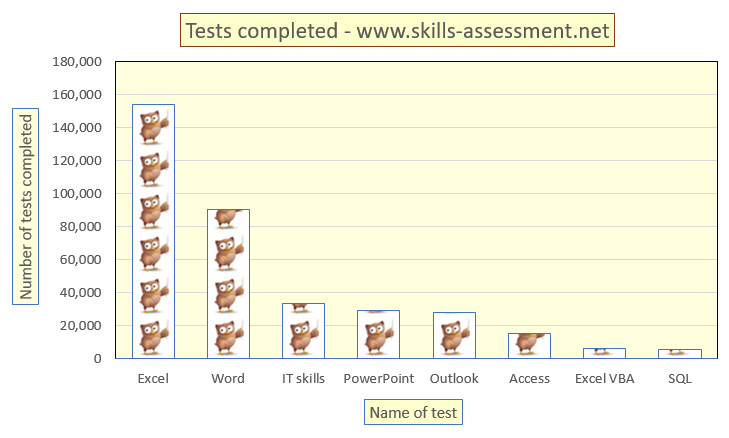 Feeling in a nostalgic mood (and being a bit of a statistics nerd), I thought I'd have a look at the 364,824 tests completed on our skills assessment test site since 1st May 2011. We plan to incorporate this into the Wise Owl site at some stage in the near future, but time is always the enemy! Excel tests account for 42% of the total. This tests only shows completed tests (35.6% of tests are aborted before completion). This line chart should rise significantly now that new Office 2016 tests have been released. If you want to see what all the fuss is about, try doing a test yourself (free of charge, and anonymously).